Hunting actually makes up a considerable portion of Red Dead Redemption 2, which is saying a lot considering how vast the game is. In our Red Dead Redemption 2 hunting guide, we'll be providing you with a complete beginner's guide to hunting in Rockstar's game, detailing how you can easily track and follow animals in the wilderness. For everything else you need on Rockstar's latest game, head over to our Red Dead Redemption 2 guides hub. Here you can find a complete beginner's guide, tips and tricks, and much more. 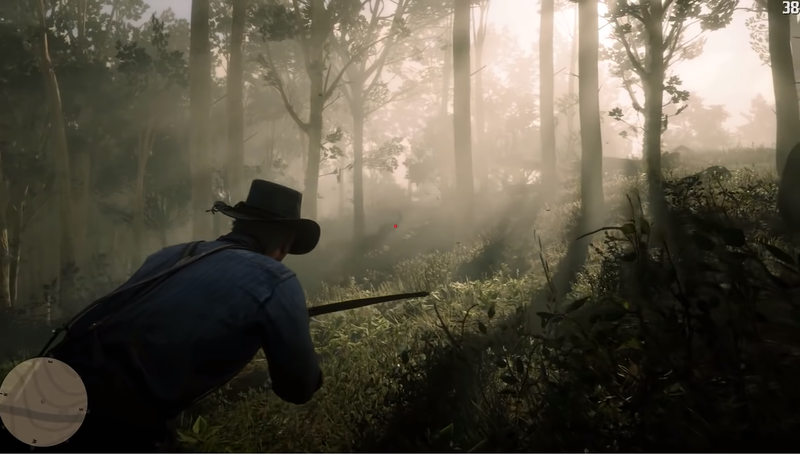 All throughout every area of Red Dead Redemption 2, you can find animals wandering the wilderness. You can track down and hunt basically any animal in the massive game, and once you've done so, you can either skin it for a hide, or bring the whole carcass back to Pearson at camp, who can put it to good use. Just below, we've rounded up a complete list of animals found in Red Dead Redemption 2. While these aren't all the animals you can find in the game, these are all the creatures we've encountered so far, and we'll be updating this list should we come across any additional animals. Alternatively, you can head over to our Legendary Animal locations guide, if you want to know the locations of all the elite animals we've found so far. Whenever you're wandering around the open world of Red Dead Redemption 2, you can press both the left and right analog sticks to go into a sort of detective mode. In this mode, you can focus on any nearby animal tracks, and press the right bumper to start tracking them. Now, when you exit the detective mode, the trail will still be visible, and you can follow the route right to the animal itself. Be careful to watch your own scent in this vision mode. If an animal is downwind of you it can pick up your scent and get spooked. As we mentioned previously, you'll have two options once you've killed an animal. You can either skin it then and there, recovering nothing more than a pelt, or you can pick up the entire carcass and put it on your horse. Either way, you can take the remains of the animal pack to Pearson at your camp if you want to boost the food meter back at home, or you can take it to a general store, and sell the remains on for some quick money. Just below, you can see our complete guides index for everything relating to hunting in Red Dead Redemption 2. There's guides on all the legendary fish locations, Trapper locations, and more. We might now be all done with this overview guide on how to track and hunt animals in Red Dead Redemption 2, but there's plenty more to cover on the game just yet. You can head over to our Red Dead Redemption 2 Cheats guide, or our page on how to dual wield in Red Dead Redemption 2 for more.